100 Victoria Embankment, London EC4Y 0DY. Earlier this year, Kevin Pietersen was effectively retired from the England team after playing for almost ten years and becoming the leading run-scorer in Tests for his adopted country. Whilst there was a clamour for information and reasoning behind the decision, Pietersen, to his credit, kept quiet but the release of his autobiography was always likely to be more forthcoming. Two points jumped out at me within a couple of days of receiving the book and suggested the impact that the book would have. The first is in the very clever cover. Plonk this book on your lap and, before you open it up, you will notice that the author's face bores into you: look at the eyes and the periodically bearded face. Look at the back at the quote and, in particular, the final paragraph. "All I ask is that you read it. Then you can judge." Appetite whetted? The second point was on a recent flight when the stewardess saw me reading the book and commented that I had "that controversial book". Other passengers looked up and started talking and asking questions. The book had been released just two days previously, hadn't hit the Gatwick book stalls but the media interest most certainly had and one of the passengers, with little interest in cricket, was enthralled by it and keen to buy it. So, where to start? Well, Pietersen's book, with assistance from David Walsh, has to be one of the most extraordinary books and far-removed from what, I suspect, many of us expect of cricket books. After the anticipation of its release, I felt that it might be a good idea, for balancing purposes, to read respected journalist Simon Wilde's recently-released book On Pietersen. 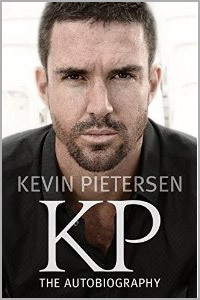 Pietersen's own version, unfortunately, mentions little about cricket and the vast majority of its 324 pages is mostly spent putting across his side of the story. One can only hope that there was a period of reflection before sending it off to the publishers and surely a glittering and successful playing career deserved a better share of the 324 pages? There is so much criticism of Andy Flower. Another case in point is Matt Prior, the so-called Big Cheese, who also has holes picked into him and ultimately the amount of space given to the coach and wicket-keeper becomes irritating. Few of the people who will read this book will be privy to what happens within the England dressing room so will be unable to comment but it comes across as a sad book. The amount of bad language used in the book quickly became tiresome and there must surely be better ways of making points than that and in the incessant demeaning of certain colleagues. Cricket writing is normally of a more decorous nature but Pietersen's readership will presumably soon make its own opinion. That said, if the bowlers did hound certain errant fielders and, in doing so, set up an unpleasant atmosphere, Pietersen should be applauded for bringing it to light if ultimately any unappetising behaviour is stopped. Many people, in sporting and more mundane office circles, may also recognise and sympathise with one-to-one and team meetings which appear to be prevalent in working life and, indeed, some of the instances in the writing might be enjoyed more but for the incessantness of the complaints. Unfortunately, whether a career is spent on the sporting field or in an office, life isn't always a bed of roses and there are bound to be many occasions where working life is not harmonious. Bullying has been and remains a difficult topic. It takes many forms and many of us have experienced it and many, myself included, will abhor the mocking of the player through social media and a spoof Twitter account. Again, though, as we know, there are many ways and forms of communication these days and Pietersen admits to periodically being on and off Twitter. It seems that, whichever choice of social media we may choose, there are pros and cons which we must accept. By many accounts, Pietersen's training ethics have been admirable. Starting his cricketing career as an off-spinner, he became England's leading run-scorer so obviously made himself into an exceptional batsman. There have, though, been accounts that he respected high-achievers and the fact that current head coach, Peter Moores, in his first stint as England coach, being an able county cricketer, did not earn that respect. Equally, there have been accounts of lesser lights making exceptional coaches. Who knows? Paul Downton, a decent England wicket-keeper in the early 1980s, had to be "googled" by Pietersen to find out about him when he became the new ECB Managing Director which suggests the same as Moores first experienced. Pietersen mentions that, in his days at Maritzburg College, respect had to be earned and, indeed some players are mentioned fondly if, at times, briefly. Some players are quoted by name, others by reference regarding the structure of the ECB and, ultimately, it is difficult to know quite what or who to believe. Wilde's book, On Pietersen, may well give more thorough answers. Cliches abound with reference to Pietersen but, love him or loathe him, maybe this time he has polarised opinion too far and this book may be seen as his parting shot. It must be difficult to see how his uneasy relationship with England can lead to a resumption in his international career after this publication but I would be surprised if this book does not sell sell like hotcakes.